"The Pen may be Mightier than the Sword . . .
but Learn to use a Sword first!" Proud to be a Fencer! Bonnie H. (1st on left, top row) takes the BRONZE medal out of 38 national foilists in San Jose, CA, earning her C08 rating! 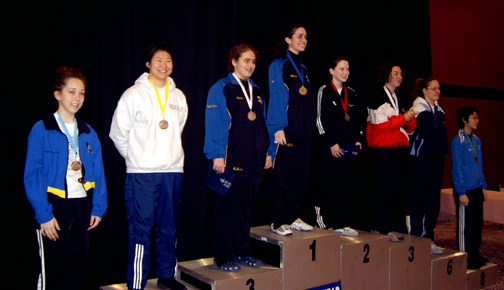 FVFA Fencer Maria N. of Simsbury (1st on right), high school senior, ends her high school fencing career grabbing the title of 2009 CT High School Girls' Epee Champion! She was undefeated throughout the entire competition with 29 fencers. CONGRATULATIONS! Pam K., Brad R., and Stuart F.
Pomme de Terre at Brandeis Univ. in Waltham, Mass. 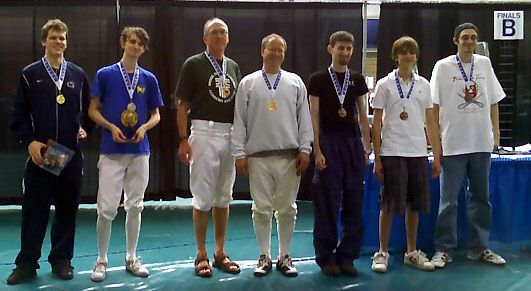 (June 23-24, 07): An excellent and VERY exciting weekend for FVFA fencers, where Devin M. earned his E07 in Men's Epee Uncl. 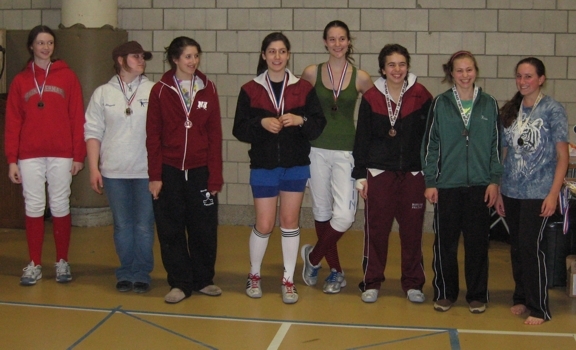 by taking 2nd place (in picture, 2nd from left) out of 20 epeeists from the New England area!! 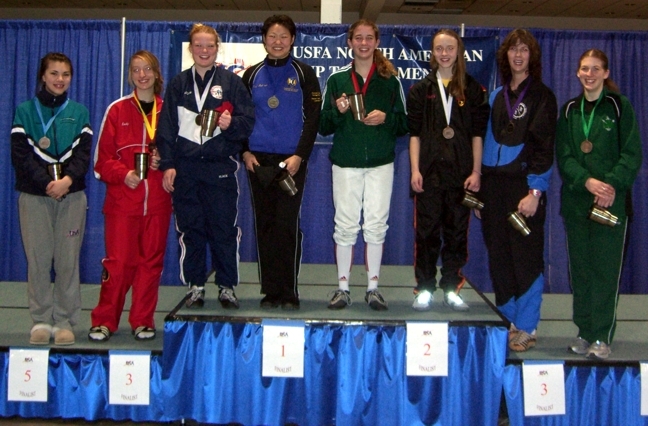 3/10-13/06: Coach Mal-sun (2nd from left) takes 5th place in Div 2 Women's Foil at the North American Cup in Reno, NV! 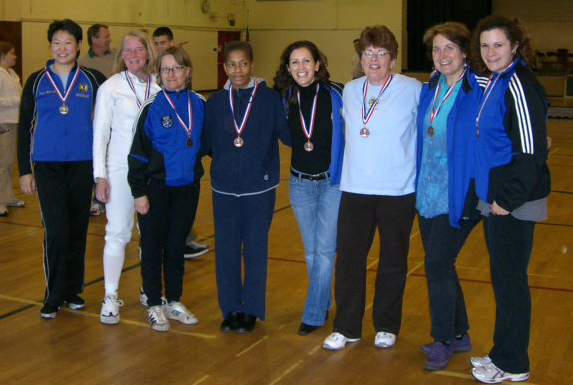 Coach Mal-sun (4th from left) takes the GOLD out of 110 foilists in Rosemont, IL, earning her B08 rating! 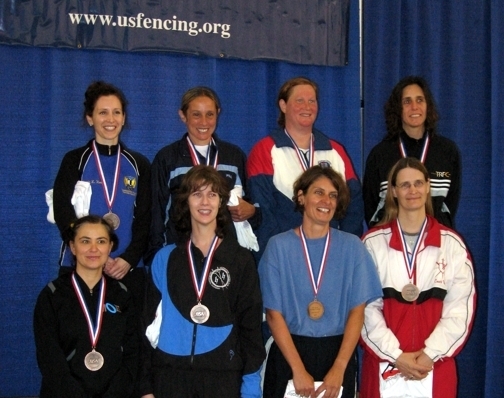 NEFA Fence Against Breast Cancer (30+) Women's Foil in Arlington, MA (10/13/07): Coach Mal-sun takes the Gold (first from left), Jennette S. the Bronze (4th from left) and Bonnie H. 5th place (5th from left) out of 18 ladies in the New England region!